Modern companies understand that in order to attract and retain the best talent, they have to compete on more than salaries, vacation, and healthcare. Companies like Google, WeWork, Pixar, and Facebook are well known for providing workspaces that inspire creativity, collaboration, and innovation. Clive Wilkinson, the architect of Google’s Silicon Valley headquarters, is quoted as saying, “75 to 80 percent of America is cubicle land. Cubicles are the worst – like chicken farming. They are humiliating, disenfranchising and isolating. So many American corporations still have them.” Modern office designs are the opposite of closed off, fluorescent-lit cubicles- they are open with natural light and little, if any, suggestion of hierarchies. 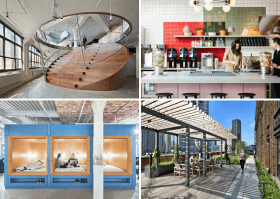 In addition to designing workspaces that inspire creativity, these modern companies also providing perks like free food, drink, and recreation to entice employees. So what are some of the best practices in designing offices for people’s emotional health and productivity? And what other perks do companies have to offer to attract the top talent?